Studies on the relationship between level of internationalization and performance of new ventures show conflicting results indicating a need for more in-depth understanding of the mechanisms underlying the relationship. This study draws on dynamic capability theory and extends the understanding of the issue. The study contributes to international entrepreneurship literature by developing a proposed model built on analyses of event histories of US operations of three Swedish international new ventures. The events take place during more than 20 years. It is proposed that the number of organizationally stable periods of the foreign unit strengthens the positive relationship between product/market knowledge transferred to the unit and its dynamic capabilities, and knowledge acquired locally by the unit and its dynamic capabilities. Also, it is proposed that dynamic capabilities aligned with the transferred and local knowledge are associated with high financial performance. Contributions to literature on international entrepreneurship are discussed. Contributions: The study contributes to literature on international entrepreneurship. By drawing on dynamic capabilities theory, the study extends the understanding of mechanisms behind level of internationalization and new venture performance. The study is needed as the findings of previous studies are not consistent regarding the character of the relationship. Purpose/research questions: The study explores mechanisms behind level of internationalization and new venture performance. Research questions: How does organizational stability of an international new venture’s (INV) foreign unit moderate the development of dynamic capabilities based on product/market knowledge? Are there any relationships between contextually bounded dynamic capabilities and financial performance of the unit? Results: A model is developed that consists of three propositions: 1. The more organizationally stable periods of an INV’s foreign unit, the stronger the positive relationship between product/market knowledge transferred from the parent firm and the foreign unit’s dynamic capabilities. 2. The more organizationally stable periods of an INV’s foreign unit, the stronger the positive relationship between product/market knowledge acquired locally and the foreign unit’s dynamic capabilities. 3. The greater the alignment between dynamic capabilities of a foreign unit of an INV and product/market knowledge transferred from the parent firm and acquired locally, the greater the probability of a positive association between foreign unit’s dynamic capabilities and its financial performance. Theoretical implications: First, the study shows that building dynamic capabilities is contingent on organizationally stable time periods. Second, the model shows that foreign unit’s dynamic capabilities mediate relationships between unit’s contextually corrected stock of product/market knowledge and financial performance. Third, the study shows that literature on international entrepreneurship needs to incorporate theory on international strategy. Fourth, the study clarifies that an INV’s building of dynamic capabilities is a complicated matter. Fifth, the study develops a set of empirical indicators. Practical implications: An INV wishing to establish a foreign unit is advised to transfer product/market knowledge to the unit in order to complement the local knowledge acquired by the unit itself. The appropriate amount of knowledge is contingent on the number of organizationally stable periods encountered by the unit. The knowledge stock is a crucial input into the unit’s development of dynamic capabilities that enable adaptation to market changes and trigger high performance. Limitations and further research: The industry context or the network context of an INV may be an explanation of the empirical pattern identified in this study. In addition, venture size may explain aspects of capability development as larger firms frequently possess greater resources. Also, the study does not examine any cause and effect relationships that may limit the value of the proposed model. These limitations represent venues for further research. Studien über den Zusammenhang zwischen dem Niveau der Internationalisierung und der Leistung der neuen Unternehmen zeigen widersprüchliche Ergebnisse, die einen Bedarf an mehr in ein tiefes Verständnis der Mechanismen, die Beziehung zugrunde liegt. Diese Studie stützt sich auf dynamische Fähigkeit Theorie und erweitert das Verständnis des Problems. Die Studie trägt dazu bei, International Entrepreneurship-Literatur durch die Entwicklung einer vorgeschlagenen Modell auf der Analyse von Ereignisentwicklungen der US-Operationen von drei schwedischen International neue Unternehmen gebaut. Die Ereignisse während mehr als zwanzig Jahren statt. Es wird vorgeschlagen, dass die Zahl der organisatorisch stabiles Perioden der ausländischen Einheit stärkt die positive Beziehung zwischen Produkt / Marktkenntnisse, um die Einheit und ihre dynamischen Fähigkeiten übertragen, und das Wissen vor Ort von dem Gerät und seinen dynamischen Fähigkeiten erworben. Es wird auch vorgeschlagen, dass dynamische Fähigkeiten mit der übertragenen und lokales Wissen ausgerichtet sind mit hohen finanziellen Leistungsfähigkeit verbunden. Beiträge zur Literatur über internationale Unternehmertum werden diskutiert. 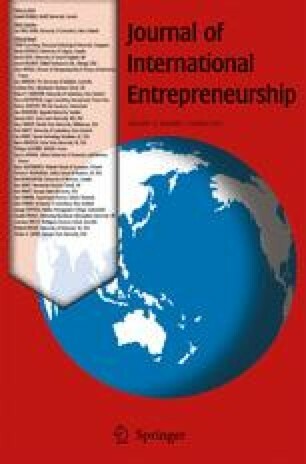 The authors are grateful for constructive comments received from the Editor of Journal of International Entrepreneurship and two anonymous reviewers.